LANSING, Mich. — State Sen. Kevin Daley announced on Friday that his Lansing office is open and that he is ready to meet the needs of constituents in the 31st Senate District. Daley’s Lansing office is located in Room 5200 of the Connie B. Binsfeld Office Building at 201 Townsend St., across from the Capitol. Daley and his staff can be contacted at 517-373-1777, and by e-mail at SenKDaley@senate.michigan.gov. The mailing address is Sen. Kevin Daley, P.O. Box 30036, Lansing, MI 48909. Included in Friday’s announcement was the newly elected senator’s complete staff list. 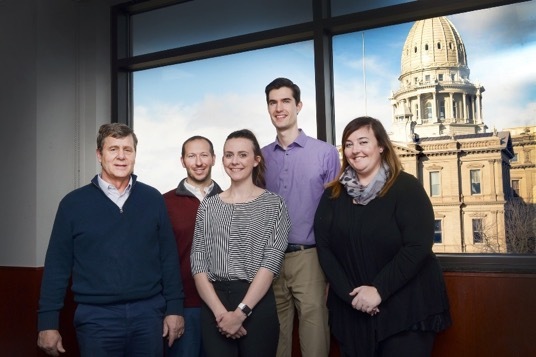 Pictured from left to right: State Sen. Kevin Daley, R-Lum, district director Matthew Bierlein, scheduler Leanna Shafer, legislative director David Raney and chief of staff Amanda Wright.